T. E. Hulme: The First Modern Poet? This poem, ‘A City Sunset’, would, along with a handful of others by Hulme, set the blueprint for modern poetry. If we most readily associate ‘modern poetry’ with brevity, precision of language, understatement, unrhymed verse, written about everyday and often very ordinary things, then we owe many of those associations to T. E. Hulme. Hulme was a larger-than-life figure in virtually every way. Standing at over six feet tall, with a ruddy complexion, a willingness to argue with anyone (or, indeed, to fight them: he once famously boxed with Wyndham Lewis in Soho Square), he hailed from Staffordshire, the county that nearly two centuries before had given the world another magnetic man of letters, Dr Johnson. After a spell at Cambridge (from which he was sent down without a degree) and a brief adventure in Canada in his early twenties, Hulme travelled to London, where he founded a Poetry Club, argued with people, ate lots of sweets (he was a teetotaller and non-smoker who preferred suet pudding and treacle to cigarettes and alcohol), and wrote, in a flurry of activity, the manifesto for modern poetry. Ezra Pound often gets the credit for having done this: the American poet and impresario later founded the Imagist movement with English poet Richard Aldington and fellow American Hilda Doolittle (known as ‘H. D.’), and wrote ‘A Few Don’ts by an Imagiste’, a short rationale which sets down some of the rules for modern poetry which Hulme, five years earlier, had already formulated. Pound and Hulme were associates, although Pound would later – somewhat uncharitably – play down the role Hulme had played in the formation of Imagist practice. Where Hulme had started off the poem by rhyming – it had begun with a rhyme on conceits/streets – he now adopts the new practice of vers libre, or ‘free verse’, unrhymed poetry which shuns regular metre and stanza structure and which would later be memorably described by Robert Frost as ‘like playing tennis with the net down’. From this unrhymed free-falling emerges an image, or rather a pair of images: the sunset, that conventional poetic trope, is likened to a woman’s red robe being trailed along the tops of the houses. This is micro-poetry, like the haiku which Pound, a few years later, would experiment with. Hulme’s experiments gave rise to Imagism, which is the first true poetry of the everyday: it often deals with ordinary details of the modern world, such as travelling in the Tube, walking the London streets, or watching the crowds of people as they leave the cinema. It predates the more famous ‘Pylon Poets’ of the 1930s by two decades. One of Hulme’s poetic fragments even outdoes the haiku for brevity, in comprising just eight words: ‘Old houses were scaffolding once / and workmen whistling.’ The network of sounds is intricate and carefully considered: ‘old’ gets a leg up from ‘scaffolding’, which encapsulates the word, while ‘were’ resurfaces in ‘workmen’, linking the two images together through such internal rhymes and echoes. Of course, there is an alternative modern poetic strand, too – the more opaque and allusive style of a T. S. Eliot or a Geoffrey Hill – but the commonest notion of ‘modern poetry’ is undoubtedly Hulme’s. His is the one that has prevailed in the popular imagination. Carol Ann Duffy suggested in 2011 that poems are a form of texting because of their condensed language and their brevity: a suggestive comparison for the poet who gave us ‘Text’, perhaps the first noteworthy poem about the experience of text-messaging. But English poetry was already growing smaller in form a hundred years ago, long before mobile phones and the world of the text message. Hulme thought poetry should be the sort of thing that a normal person could read and appreciate in the Tube on their way to work, or in the armchair after dinner. He left us a handful of poems which were later praised by T. S. Eliot as ‘two or three of the most beautiful short poems in the language’. He scaled down poetry, but his achievement is far from small: he helped to create modern poetry as we know it today. 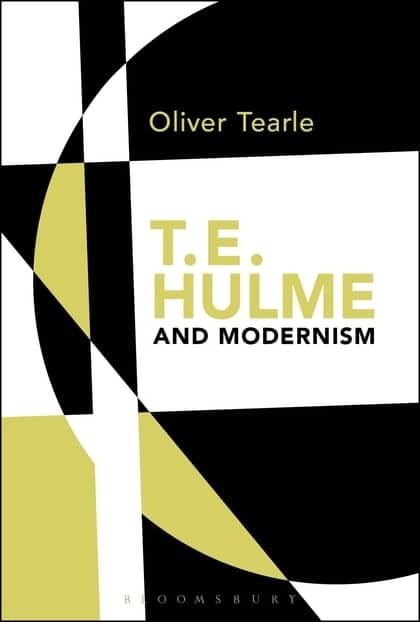 For more about Hulme, see this new book by the founder-editor of Interesting Literature, Dr Oliver Tearle, T.E. Hulme and Modernism. As always, informative and well-written. Thank you, Oliver. Thank you for the comment, Bill! As always, thanks for reading: it’s greatly appreciated. Apologies for the great, ill-temered sprawl under your Shakespearean article. I feel I owe you something more interesting. So what about Keats’ claim?? No need to apologise at all – it’s quite a new and exciting thing to have been host to such a to-and-fro! You made some wonderful points, too, which I’m sure Stanley Wells would have cheered. Thanks for the Keats fragment – that’s always struck me as peculiarly modern. I also like the sonnet where the penultimate line breaks off halfway too (can’t remember offhand which one, but the line in question goes something like, ‘Hear ye not the hum / Of mighty workings?’). A really good post, with plenty of food for thought. I’d quite forgotten about Hulme, and you do a great job in locating him in his context. Straight after reading this I went to the only Hulme I have at home, which is the selection in the old “Faber Book of Modern Verse”. Mine is the fourth and final edition from the 80’s, but it reprints Michael Roberts’s original introduction from the 1930’s. Interestingly, from his perspective the first identifiably ‘modern’ poet is Gerard Manley Hopkins. Either way, I’m so glad you’ve reminded me about Hulme in this way. Thanks very much for the generous comment! It’s hard to distil a whole book into a blog post, but I thought the most important thing was to highlight his chief contribution to modern poetry. That’s a good find: Roberts was an important early critic (and biographer) of Hulme, and much later work owes a considerable debt to him (my own included). That said, although I take his point about Hopkins, I still think Hopkins is a lot more ‘Victorian’ than Roberts was prepared to acknowledge – but then there can be no definite answer to a starting point for modern poetry, I suppose, only arguments and interpretations. Great to talk about it and get the discussion reignited, though! I am going to dig out my Faber Book of Modern Verse. It’ll be with the Faber Book of Ballads somewhere. It’s the sonnet about Wordsworth who also had his modernist moments and it’s a rather brilliant setup for his last line. I had to Google it as I remembered only the same fragment as you did. My first acquaintance with Keat’s Living Hand was five minutes before my university interview. The Profs were running late and one of them came out into the corridor where I was waiting, handed it to me, typed on blank piece of paper, and said ‘when you come in, tell us what you make of that’. A mean trick. Super! That’s it, I remember the rest now. What a poem to throw at you right before your interview, though! I suppose it makes sense – though I’d probably choose a Hulme poem myself, in their position. I’ve tried them out on my students and they’ve always seen more in the poems than you’d expect from such short, seemingly straightforward pieces. He claimed later that was his reason for doing it. He didn’t expect anyone to identify it or its period, he was just looking for any trace of insightful comment. I adopted the technique for interviewing in my own business. Thanks to everyone. Now I know where to look for modern poetry-The Faber Book of Modern Verse.At least that will be a start. An excellent place to start, indeed! Love ‘A city sunset ‘ very much. I find it interesting that you limit the description of the ‘modern’ to concerns about formal qualities. For me, at least, appreciation of a poets work is increased by investigating the way in which it is embedded within a whole network of human concerns and practises, economic, social, cultural, political, spiritual. Imagist poems seem to very much evoke the destruction of the old order and the experience of a world of increasing fragmentation and disorder in which one can only grasp at truth in the form of fragmented scraps of experience rescued from the void; and by a dislocated and alienated subject who miraculously succeeds in distilling a meaning from experience in a world emptied of anything semblance of a coherent truth whatsoever. Thanks for such an insightful comment – no rambling at all as I read it! Very perceptive stuff. I agree that the Imagists – and modern poetry around that time – was a response to a larger shift in culture, the world, technology, politics, etc. I think of Flint’s ‘Tube’ and Richard Aldington’s ‘In the Tube’, classic examples of how travelling to work on the Underground brought strangers closer together, only to make them realise how alienated we all are from each other (it’s something Woolf explores too, e.g. the omnibus in Jacob’s Room). The fragmentariness is interesting, as with a lot of modernist literature – the form of the new literature represents the breaking down of an old way of life and an old order – and is something I devote quite a bit of time to in my book, since Hulme was fond of the fragment. I’d recommend ‘The Embankment’ as probably Hulme’s masterpiece, but really if you can find more of them, read the lot – it won’t take more than ten minutes, and there are some other gems among his complete works! Thanks again for the comment, which has sent me back to this issue of fragmentariness and modernity – which can only be a good thing. As always, an interesting post. From this blog, I always learn something new and interesting :) You also generate lots of great comments! Thanks Marie! It’s the marvellous comments that keep me writing – it’s good to know there are others out there who share my love of the interesting and surprising aspects of literature. And I always learn something new which I wish I’d included in the post, had I known it. Thanks also for the reblog! Who wrote the first modern poem? Learn more at Interesting Literature! I’m going to go out on a limb and say Hulme wasn’t the only person who had an irresistible desire to fight Lewis. He was quite the agitator. Thanks for the interesting and accessible post. I will most definitely peruse your book! I think you’re right there – Lewis had a knack of rubbing people up the wrong way! Next to him, Hulme looks positively placid… Thanks for the kind comment; I really appreciate it. I hope you enjoy the book … I really enjoyed writing it. Thanks for a fascinating post, and also for the discussion afterwards. Rather to my shame (as I’m a fan of both poets) I wasn’t familiar with Keats’ sonnet on Wordsworth. I am ashamed to say also that i know nothing of the poetry of Hulme, but i shall most certainly pursue this. Thanks very much, Himadri – glad you enjoyed the piece. And don’t feel too ashamed! It’s easy to overlook Hulme, given his meagre output and the fact that, although he is anthologised, it’s difficult to know how to respond to them without knowing their context and how important they were for imagism, and modernist poetry and thought more widely (Eliot and Pound especially). I confess that, until I read a few of his poems a couple of years ago in an anthology and was intrigued by them, I knew very little … but then I suppose that’s often the best way to approach research, as you come to your subject with a fresh eye and fresh enthusiasm. It’s well worth reading ‘The Embankment’: http://www.poetryfoundation.org/poem/173697 but there are other short poems available online too (and they are short: very few of them are over eight or nine lines! ).